Report by Major Tunbridge about Elands River, 15 September 1900, page 5. 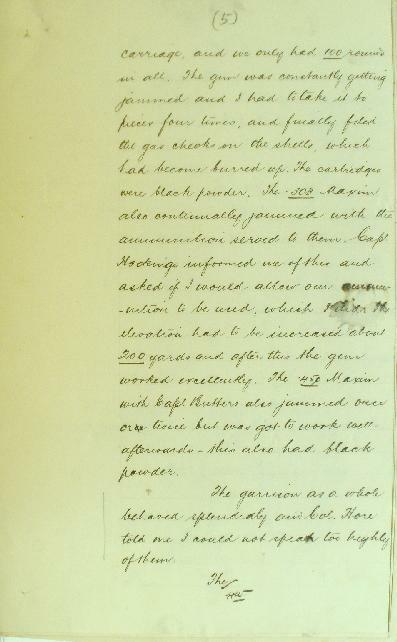 On 15 September 1900, Major Tunbridge wrote a report of the action at Elands River for the NSW General Staff of which page 5 is transcribed below. … carriage, and we only had 100 rounds in all. The gun was constantly getting jammed and I had to take it to pieces four times, and finally filed the gas checks on the shells, which had become blurred up. The cartridges were black powder. The .303 Maxim also continually jammed with the ammunition served to them. Captain Hockings informed me of this and asked if I could allow our ammunition to be used, which I did. The elevation had to be increased about 200 yards and after this the gun worked excellently. The .450 Maxim with Captain Butters also jammed once or twice but was got to work well afterwards - this also had black powder. The garrison as a whole behaved splendidly and Colonel Hore told me I could not speak too highly of them.